This article is about the long gun. For other uses, see Rifle (disambiguation). A rifle is a firearm designed to be fired from the shoulder, with a barrel that has a helical groove or pattern of grooves ("rifling") cut into the barrel walls. The raised areas of the rifling are called "lands," which make contact with the projectile (for small arms usage, called a bullet), imparting spin around an axis corresponding to the orientation of the weapon. When the projectile leaves the barrel, this spin lends gyroscopic stability to the projectile and prevents tumbling, in the same way that a properly thrown American football or rugby ball behaves. This allows the use of aerodynamically-efficient pointed bullets (as opposed to the spherical balls used in muskets) and thus improves range and accuracy. The word "rifle" originally referred to the grooving, and a rifle was called a "rifled gun." Rifles are used in warfare, hunting and shooting sports. Typically, a bullet is propelled by the contained deflagration of an explosive compound (originally black powder, later cordite, and now nitrocellulose), although other means such as compressed air are used in air rifles, which are popular for vermin control, hunting small game, formal target shooting and casual shooting ("plinking"). In most armed forces the term "gun" is incorrect when referring to small arms; in military parlance, the word "gun" refers to an artillery piece or crew-served machine gun. Furthermore, in many works of fiction a rifle refers to any weapon that has a stock and is shouldered before firing, even if the weapon is not rifled or does not fire solid projectiles (e.g. a "laser rifle"). Formerly, rifles only fired a single projectile with each squeeze of the trigger. Modern rifles are capable of firing more than one round per trigger squeeze; some fire in a fully automatic mode and others are limited to fixed bursts of two, three, or more rounds per squeeze. Thus, modern automatic rifles overlap to an extent in design and function with machine guns. In fact, many light machine guns (such as the Russian RPK) are adaptations of existing automatic rifle designs. Generally, the difference between an automatic rifle and a machine gun comes down to weight and feed system; rifles, with their relatively light components (which overheat quickly) and small magazines, are incapable of sustained automatic fire in the way that machine guns are. Modern military rifles are fed by box magazines, while machine guns are generally belt-fed. Machine guns are often crewed by more than one soldier; the rifle is an individual weapon. The term "rifle" is sometimes used to describe rifled weapons firing explosive shells; for example the recoilless rifle. The origins of rifling are difficult to trace, but some of the earliest practical experiments seem to have occurred in Europe during the 15th century. Archers had long realized that a twist added to the tail feathers of their arrows gave them greater accuracy. Early muskets produced large quantities of smoke and soot, which had to be cleaned from the action and bore of the musket frequently, either through the action of repeated bore scrubbing, or a deliberate attempt to create "soot grooves" that would allow for more shots to be fired from the firearm. This might also have led to a perceived increase in accuracy, although no one knows for sure. True rifling dates from the mid-15th century, although military commanders preferred smooth bore weapons for infantry use because rifles were much more prone to problems due to powder fouling the barrel. Rifles were created as an improvement in the accuracy of smooth bore muskets. In the early 18th century, Benjamin Robins, an English mathematician, realized that an elongated bullet would retain the momentum and kinetic energy of a musket ball, but would slice through the air with greater ease. The black powder used in early muzzle loading rifles quickly fouled the barrel, making loading slower and more difficult. Their greater range was also considered to be of little practical use, since the smoke from black powder quickly obscured the battlefield and made it almost impossible to target the enemy from a distance. Since musketeers could not afford to take the time to stop and clean their barrels in the middle of a battle, rifles were limited to use by sharpshooters and non-military uses like hunting. Muskets were smoothbore, large caliber weapons using ball-shaped ammunition fired at relatively low velocity. Due to the high cost and great difficulty of precision manufacturing, and the need to load readily from the muzzle, the musket ball was a loose fit in the barrel. Consequently on firing the ball bounced off the sides of the barrel when fired and the final direction on leaving the muzzle was unpredictable. Muskets had to be long so the muzzles of the rear rank’s muskets projected well forward of the faces of the front rank. The performance of early muskets was effective for the styles of warfare at the time, whereby soldiers tended to stand in long, stationary lines and fire at the opposing forces. Precise aiming and accuracy were not necessary to hit an opponent. Muskets were used for comparatively rapid, imprecisely aimed volley fire, and the average soldier could be easily trained to use them. The (muzzle-loaded) rifle was originally a sharpshooter's weapon used for targets of opportunity and deliberately aimed fire, first gaining notoriety in warfare during the Seven Years War and American War for Independence through their use by American frontiersmen. Later during the Napoleonic Wars, the British 95th Regiment (Green Jackets) and 60th Regiment, (Royal American), as well as American sharpshooters and riflemen during the War of 1812, used the rifle to great effect during skirmishing. Because of a slower loading time than a musket, they were not adopted by the whole army. Since rifles were used by sharpshooters who didn't routinely fire over other men’s shoulders, long length was not required to avoid the forward line. A shorter length made a handier weapon in which tight-fitting balls did not have to be rammed so far down the barrel. The invention of the minie balls in the 1840s solved the slow loading problem, and in the 1850s and 1860s rifles quickly replaced muskets on the battlefield. Many rifles, often referred to as rifled muskets, were very similar to the muskets they replaced, but the military also experimented with other designs. Breech loading weapons proved to have a much faster rate of fire than muzzle loaders, causing military forces to abandon muzzle loaders in favor of breech loading designs in the late 1860s. In the later part of the 19th century, rifles were generally single-shot, breech-loading — designed for aimed, discretionary fire by individual soldiers. Then, as now, rifles had a stock, either fixed or folding, to be braced against the shoulder when firing. The adoption of cartridges and breech-loading in the 19th century was concurrent with the general adoption of rifles. In the early part of the 20th century, soldiers were trained to shoot accurately over long ranges with high-powered cartridges. World War I Lee-Enfields rifles (among others) were equipped with long-range 'volley sights' for massed firing at ranges of up to 1.6 km (1 mi). Individual shots were unlikely to hit, but a platoon firing repeatedly could produce a 'beaten ground' effect similar to light artillery or machine guns; but experience in World War I showed that long-range fire was best left to the machine gun. Currently, rifles are the most common firearm in general use for hunting purposes (with the exception of bird hunting where shotguns are favored). Rifles derived from military designs have long been popular with civilian shooters. (left) "Premier Consul" model flintlock carbine made by Jean Lepage and named for the First Consul Napoléon Bonaparte, circa 1800; (right) rifling of the Lepage carbine. During the Napoleonic Wars the British army created several experimental units known as "Rifles", armed with the Baker rifle. These Rifle Regiments were deployed as skirmishers during the Peninsular war in Spain and Portugal, and were more effective than skirmishers armed with muskets due to their accuracy and long range. Gradually, rifles appeared with cylindrical barrels cut with helical grooves, the surfaces between the grooves being "lands". The innovation shortly preceded the mass adoption of breech-loading weapons, as it was not practical to push an overbore bullet down through a rifled barrel, only to then (try to) fire it back out. The dirt and grime from prior shots was pushed down ahead of a tight bullet or ball (which may have been a loose fit in the clean barrel before the first shot), and, of course, loading was far more difficult, as the lead had to be deformed to go down in the first place, reducing the accuracy due to deformation. Several systems were tried to deal with the problem, usually by resorting to an under-bore bullet that expanded upon firing. The method developed by Delvigne for his rifles, with the lead bullet being supported by a wooden sabot at its base. The original muzzle-loading rifle, with a closely fitting ball to take the rifling grooves, was loaded with difficulty, particularly when foul, and for this reason was not generally used for military purposes. Even with the advent of rifling the bullet itself didn't change, but was wrapped in a greased, cloth patch to grip the rifling grooves. The first half of the 19th century saw a distinct change in the shape and function of the bullet. 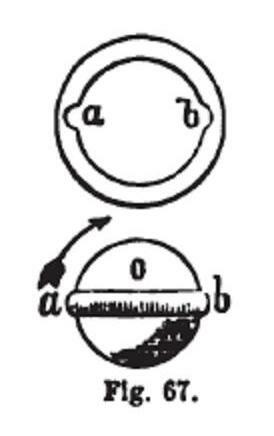 In 1826 Delvigne, a French infantry officer, invented a breech with abrupt shoulders on which a spherical bullet was rammed down until it caught the rifling grooves. Delvigne's method, however, deformed the bullet and was inaccurate. Soon after, the Carabine à tige was invented by Louis-Etienne de Thouvenin, which provided for a stem at the bottom at the barrel that would deform and expand the base of the bullet when rammed, therefore enabling accurate contact with the rifling. However, the area around the stem would clog and get dirty easily. French-made Minié rifle used in Japan during the Boshin war (1868-1869). One of the most famous was the Minié system, invented by French Army Captain Claude-Étienne Minié, which relied on a conical bullet (known as a Minié ball) with a hollow skirt at the base of the bullet. When fired, the skirt would expand from the pressure of the exploding charge and grip the rifling as the round was fired. The better seal gave more power, as less gas escaped past the bullet, which combined with the fact that for the same bore (caliber) diameter a long bullet was heavier than a round ball. The extra grip also spun the bullet more consistently, which increased the range from about 50 yards for a smooth bore musket to about 300 yards for a rifle using the Minié system. The expanding skirt of the Minié ball also solved the problem that earlier tight fitting bullets were difficult to load as black powder residue fouled the inside of the barrel. The Minié system allowed conical bullets to be loaded into rifles just as quickly as round balls in smooth bores, which allowed rifle muskets to replace muskets on the battlefield. Minié system rifles, notably the U.S. Springfield and the British Enfield of the early 1860s, featured prominently in the U.S. Civil War, due to their enhanced power and accuracy. Over the 19th century, bullet design also evolved, the bullets becoming gradually smaller and lighter. By 1910 the standard blunt-nosed bullet had been replaced with the pointed, 'spitzer' bullet, an innovation that increased range and penetration. Cartridge design evolved from simple paper tubes containing black powder and shot, to sealed brass cases with integral primers for ignition, while black powder itself was replaced with cordite, and then other nitro-cellulose-based smokeless powder mixtures, propelling bullets to higher velocities than before. The increased velocity meant that new problems arrived, and so bullets went from being soft lead to harder lead, then to copper jacketed, in order to better engage the spiraled grooves without "stripping" them in the same way that a screw or bolt thread would be stripped if subjected to extreme forces. From 1836, breech-loading rifles were introduced with the German Dreyse Needle gun, and followed by the French Tabatière in 1857 the British Calisher and Terry carbine made in Birmingham and later in 1864 and the more well known British Snider-Enfield. Primitive chamber-locking mechanisms were soon replaced by bolt-action mechanisms, exemplified by the Chassepot in 1866. Breech loading was to have a major impact on warfare, as breech-loading rifles can be fired at a rate many times higher than muzzle loaded rifles and significantly can be loaded from a prone rather than standing position. Firing prone (i.e., lying down) is more accurate than firing from a standing position, while a prone rifleman presents a much smaller target than a standing soldier. The higher accuracy and range, combined with reduced vulnerability generally benefited the defense while making the traditional battle between lines of standing and volleying infantry men obsolete. Revolving rifles were an attempt to increase the rate of fire of rifles by combining them with the revolving firing mechanism that had been developed earlier for revolving pistols. Colt began experimenting with revolving rifles in the early 19th century, and other manufacturers like Remington later experimented with them as well. The Colt Revolving Rifle Model 1855 was an early repeating rifle and the first one to be used by the U.S. Government, and saw some limited action during the American Civil War. Revolvers, both rifles and pistols, tend to spray fragments of metal from the front of the cylinder. This is not a problem for pistols, since both of the shooter's hands are behind the cylinder. A rifleman needs to have one hand in front of the cylinder to balance the weapon, and as a result, would end up with shards of metal sprayed at high velocity into his forearm. Cap and ball type revolvers were also prone to chain fire, which again was more of a problem for rifles since the rifleman's arm was in front of the cylinder. These undesirable characteristics severely limited the revolving rifle's popularity. An important area of development was the way that cartridges were stored and used in the weapon. The Spencer repeating rifle was a breech-loading manually operated lever action rifle that was adopted by the United States. Over 20,000 were used during the American Civil War. It marked the first adoption of a removable magazine-fed infantry rifle by any country. The design was completed by Christopher Spencer in 1860. It used copper rimfire cartridges stored in a removable seven round tube magazine, enabling the rounds to be fired one after another. When the magazine was empty, it could be exchanged for another. World War I and World War II had significant impacts on the design and use of the rifle. By the time of the first world war, the rifle had already been established as the stock weapon for modern infantry. Until the early 20th century rifles tended to be very long; an 1890 Martini-Henry was almost 2 m (6 ft) in length with a fixed bayonet. The demand for more compact weapons for cavalrymen led to the carbine, or shortened rifle. The advent of massed, rapid firepower of the machine gun, submachine gun and the rifled artillery piece was so quick as to outstrip the development of any way to attack a trench defended by riflemen and machine gunners. The carnage of World War I was perhaps the greatest vindication and vilification of the rifle as a military weapon. Experience in World War I led German military researchers to conclude that long-range aimed fire was less significant at typical battle ranges of 300 m. As mechanisms became smaller, lighter and more reliable, semi-automatic rifles, including the M1 Garand, appeared. World War II saw the first mass-fielding of such rifles, which culminated in the Sturmgewehr 44, the first assault rifle and one of the most significant developments of 20th century small-arms. During and after World War II it became accepted that most infantry engagements occur at ranges of less than 300 m; the range and power of the large battle rifles was "overkill"; and the weapons were heavier than the ideal. This led to Germany's development of the 7.92 x 33 mm Kurz (short) round, the Karabiner 98, the MKb-42, and ultimately, the assault rifle. Today, an infantryman's rifle is optimized for ranges of 300 m or less, and soldiers are trained to deliver individual rounds or bursts of fire within these distances. Typically, the application of accurate, long-range fire is the domain of the marksman and the sniper in warfare, and of enthusiastic target shooters in peacetime. The modern marksman rifle and sniper rifle are usually capable of accuracy better than 0.3 mrad at 100 yards (1 arcminute). By contrast, civilian rifle design has not significantly advanced since the early part of the 20th century. Modern hunting rifles have fiberglass and carbon fiber stocks and more advanced recoil pads, but are fundamentally the same as infantry rifles from 1910. Many modern sniper rifles can trace their ancestry back for well over a century, and the Russian 7.62 x 54 mm cartridge, as used in the front-line Dragunov Sniper Rifle (SVD), dates from 1891. Some early rifled guns were created with special barrels that had a twisted polygonal shape, in particular the Whitworth rifle was the first to be made with the intention of spinning the round for the use of as a "rifle". Specially made bullets were designed to match the shape so the bullet would grip the rifle bore and take a spin that way. These were generally limited to large caliber weapons and the ammunition still did not fit tightly in the barrel. Many experimental designs used different shapes and degrees of spiraling; one widely produced example was the Metford rifling in the Pattern 1888 Lee-Metford service rifle. Although uncommon, polygonal rifling is still used in some weapons today with one example being the Glock line of pistols (which fire standard bullets). Unfortunately, many early attempts resulted in dangerous backfiring, which could lead to destruction of the weapon and serious injury to the person firing it. As the bullet enters the barrel, it inserts itself into the rifling, a process that gradually wears down the barrel, and also causes the barrel to heat up more rapidly. Therefore, some machine-guns are equipped with quick-change barrels that can be swapped every few thousand rounds, or in earlier designs, were water-cooled. Unlike older carbon steel barrels, which were limited to around 1,000 shots before the extreme heat caused accuracy to fade, modern stainless steel barrels for target rifles are much more resistant to wear, allowing many thousands of rounds to be fired before accuracy drops. (Many shotguns and small arms have chrome-lined barrels to reduce wear and enhance corrosion resistance. This is rare on rifles designed for extreme accuracy, as the plating process is difficult and liable to reduce the effect of the rifling.) Modern ammunition has a hardened lead core with a softer outer cladding or jacket, typically of an alloy of copper and nickel - cupro-nickel. Some ammunition is even coated with molybdenum disulfide to further reduce internal friction - the so-called 'moly-coated' bullet. Rifles were initially single-shot, muzzle-loading weapons. During the 18th century, breech-loading weapons were designed, which allowed the rifleman to reload while under cover, but defects in manufacturing and the difficulty in forming a reliable gas-tight seal prevented widespread adoption. During the 19th century, multi-shot repeating rifles using lever, pump or linear bolt actions became standard, further increasing the rate of fire and minimizing the fuss involved in loading a firearm. The problem of proper seal creation had been solved with the use of brass cartridge cases, which expanded in an elastic fashion at the point of firing and effectively sealed the breech while the pressure remained high, then relaxed back enough to allow for easy removal. By the end of the 19th century, the leading bolt-action design was that of Paul Mauser, whose action—wedded to a reliable design possessing a five-shot magazine—became a world standard through two world wars and beyond. The Mauser rifle was paralleled by Britain's ten-shot Lee-Enfield and America's 1903 Springfield Rifle models (the latter pictured above). The American M1903 closely copied Mauser's original design. Barrel rifling dramatically increased the range and accuracy of the musket. Indeed, throughout its development, the rifle's history has been marked by increases in range and accuracy. From the Minié rifle and beyond, the rifle has become ever more potent at long range strikes. In recent decades, large-caliber anti-materiel rifles, typically firing between 12.7 mm and 20 mm caliber cartridges, have been developed. The US Barrett M82A1 is probably the best-known such rifle. These weapons are typically used to strike critical, vulnerable targets such as computerized command and control vehicles, radio trucks, radar antennae, vehicle engine blocks and the jet engines of enemy aircraft. Anti-materiel rifles can be used against human targets, but the much higher weight of rifle and ammunition, and the massive recoil and muzzle blast, usually make them less than practical for such use. The Barrett M82 is credited with a maximum effective range of 1,800 m (1.1 mi); and it was with a .50BMG caliber McMillan TAC-50 rifle that Canadian Master Corporal Rob Furlong made the longest recorded (until 2010) confirmed sniper kill in history, when he shot a Taliban fighter at a range of 2,430 m (1.51 mi) in Afghanistan during Operation Anaconda in 2002. Since then a British Army sniper beat the Canadian's record by 150 ft (46 m), by killing two Taliban insurgents at a range of 8,120 ft (2,470 m). He was using a standard issue British Army sniper rifle, the L115A3. Bullets leaving a rifled barrel can spin at over 100,000 revolutions per minute (rpm) depending on the muzzle velocity of the bullet and the pitch of the rifling. The rotational speed of the bullet can be calculated by using the formula below. The formula divides the number of inches in a foot (12) by the rate of twist that the barrel has. This number is multiplied by the muzzle velocity (MV) and the number of seconds in a minute (60). For example, a bullet with a muzzle velocity of 3,000 feet per second (910 m/s) leaving a barrel that twists once per foot (1/12") would rotate at 180,000rpm. Excessive rotational speed can exceed the bullet's designed limits and the inadequate centripetal force will fail to keep the bullet from disintegrating in a radial fashion. Rifles may be chambered in a variety of calibers, from as low as .17 (4.4mm) varmint calibers to as high as .80 caliber in the case of the largest anti tank rifles. The term caliber essentially refers to the width of the bullet fired through a rifle's barrel. Armies have consistently attempted to find and procure the most lethal and accurate caliber for their firearms. The standard calibers used by the world's militaries tend to follow worldwide trends. These trends have significantly changed during the centuries of firearm design and re-design. Muskets were normally chambered for large calibers, such as .50 or .59, with the theory that these large bullets caused the most damage. During World War I and II, most rifles were chambered in .30 caliber, a combination of power and speed. Examples would be the .303 British Lee-Enfield, the American M1903 .30-06, and the German 8mm Mauser K98. An exception was the Italian Modello 91 rifle, that used the 6.5×52mm Mannlicher-Carcano cartridge. Detailed study of infantry combat during and after WWII revealed that most small-arms engagements occurred within 100 meters, meaning that the power and range of the traditional .30-caliber weapons (designed for engagements at 500 meters and beyond) was essentially wasted. The single greatest predictor of an individual soldier's combat effectiveness was the number of rounds he fired. Weapons designers and strategists realized that service rifles firing smaller-caliber projectiles would allow troops to carry far more ammunition for the same weight. The lower recoil and more generous magazine capacities of small-caliber weapons also allows troops a much greater volume of fire, compared to historical battle rifles. Smaller, faster traveling, less stable projectiles have also demonstrated greater terminal ballistics and therein, a greater lethality than traditional .30-caliber rounds. Most modern service rifles fire a projectile of approximately 5.56mm. Examples of firearms in this range are the American 5.56 mm M16 and the Russian 5.45×39mm AK-74. Wikimedia Commons has media related to Rifles. ↑ "The How and Why of Long Shots and Straight Shots". Cornhill Magazine. April 1860. http://www.researchpress.co.uk/longrange/longshots.htm. ↑ "Rifled Breach Loader". globalsecurity.org. http://www.globalsecurity.org/military/systems/ground/rifle-history.htm. ↑ Friscolanti, Michael (2006-05-15). "We were abandoned". Rogers Publishing. pp. p18–25. http://www.macleans.ca/canada/national/article.jsp?content=20060515_126689_126689. ↑ Drury, Ian (2 May 2010). "The super sniper: Hero picks off two Taliban from a mile and a half away". Mail Online. London. http://www.dailymail.co.uk/news/article-1270414/British-sniper-sets-new-sharpshooting-record-1-54-mile-double-Taliban-kill.html. Retrieved 26 August 2010. ↑ "Calculating Bullet RPM — Spin Rates and Stability". AccurateShooter.com. http://accurateshooter.wordpress.com/2008/06/03/calculating-bullet-rpm-spin-rates-and-stability/. Retrieved 26 August 2010. ↑ "Topic of the Month: July 2001 - Twist Rate". Load From A Disk. http://www.loadammo.com/Topics/July01.htm. Retrieved 26 August 2010.